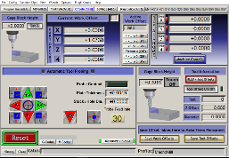 This ATC screen-set and M6 Macros were Designed for a CNC Router Using a High Speed ATC spindle with ISO 20 Tool holders . What Makes My Screen set unique is the ability to place any tool up to 99 in any slot so your not limited to only using numbers 1- 8. requiring you to update your tool Table with each run. 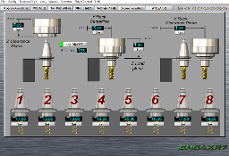 Manually load the rack by selecting the slot number. 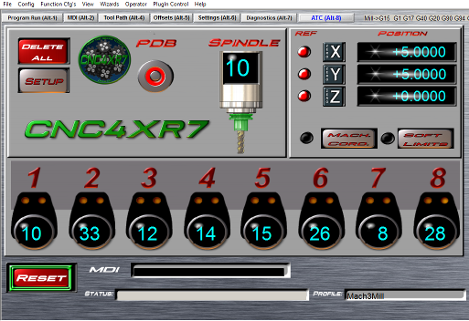 Simple buttons to to activate the PDB with a 3 second delay built in to Manually insert tools. Features visual and dynamic indications for the PDB, Spindle DRO, and weather or not the tool is secured. 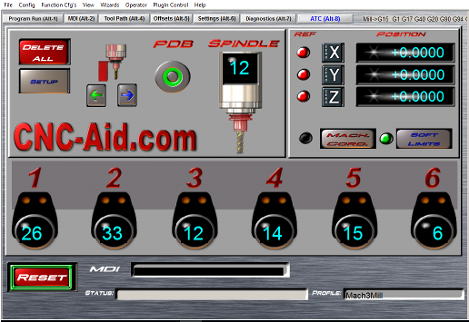 Each Slot position has it's own DRO so you know which tool is located where. Built in checks and errors messages when tools are not secured or released.